Atzeneta del Maestrat is a small town located in the region of Alcalatén. With just over 1,300 inhabitants, it preserves an important medieval and Renaissance heritage. The history of Atzeneta is based on the settling of the Berbers from the north of Africa, and the town is named after them today. From 1316, it formed part of the territories of the Order of Montesa, a religious, military order founded by Jaime II of Aragon in the 14th century, and was integrated in the territory of Maestrat. Before the 14th century, this town was known as Villa "Cerrada"- the "closed town"- as it was built between two gorges as a form of natural defence and a wall was built around the section that the gorges did not cover. From the 15th century, Atzeneta del Maestrat started to grow and throughout its history it has left monuments as emblematic as the old Palace of the Commander of Montesa, which is currently home to the town hall; the San Bartolomé parish church, with its baroque altarpiece and image of Pietà, a 17th century masterpiece; and, the Torre de la Presó tower which forms part of the old medieval walls which protected its population. It was used as a prison until the 60s in the 20th century. Nowadays it has been restored and converted into a museum called "Centro de Interpretación de la Historia de Atzeneta del Maestrat" which explains the town's history. 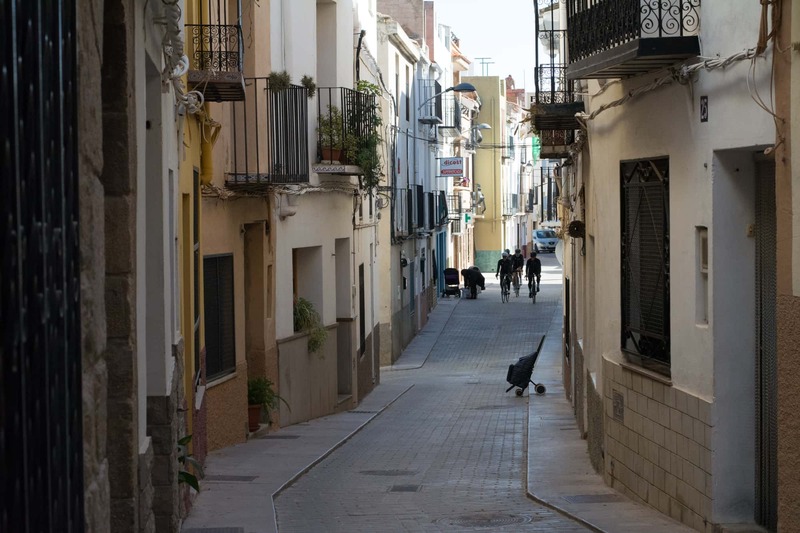 Not only is this a good option for a weekend of disconnecting and relaxing, wandering around its streets and revelling in its surrounding mountains, we can also enjoy its archaeological sites, as the town is rich in Iberian ceramic which can be found on the outskirts of the San Juan del Castell chapel. 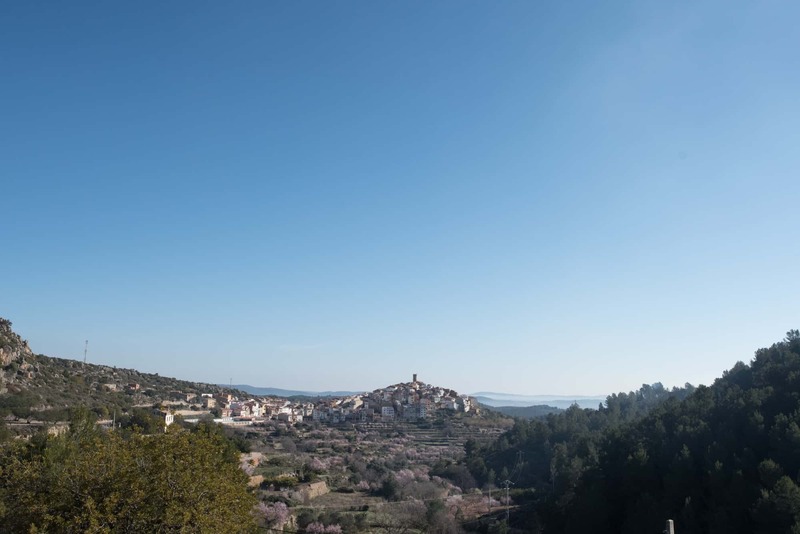 In Atzeneta del Maestrat we can enjoy the rich agricultural scenery among the olive and almond groves, with this being a town dedicated to agriculture and farming. Located in a valley under the Peñagolosa mountain, we can enjoy its rich gastronomy which is characterised by its cured meats, dishes with kid "cabrito" and its paella with meatballs. 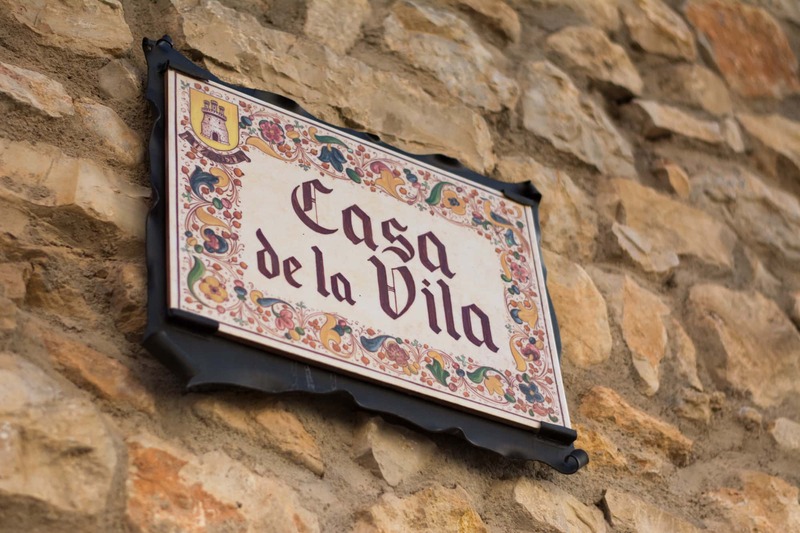 At Casa Ramón (Avenida Castello 74) we can enjoy a typical lunch at a reasonable price which will give us the strength we need for the route. El Mangranar is another classic restaurant, located on the outskirts of Atzeneta del Maestrat, on the Xodos road at 3.4 km. You can also book a room in their rural hotel, which is both surrounded by nature and affordable. A room at the Mas el Cuquello hotel is a little dearer: this is a 19th century rural house located in Alto Maestrago, some 7 km from Atzeneta del Maestrat. San Juan del Castell: An architecturally interesting Gothic building which dates back to the year 1516. - Palace of the Commander of Montesa (the current town hall): A historic building which is currently home to the town council offices, and exhibition room, an centre for elderly people and the Casa de la Cultura conference hall. San Bartolomé parish church: Renaissance style from the 17th century. Its highlights include its baroque altarpiece from 1744 and its image of Pietà. La Torre de la Presó: part of the old medieval walls which has now been converted into the ‘Centro de Interpretación de la Historia de Atzeneta del Maestrat’ history museum. 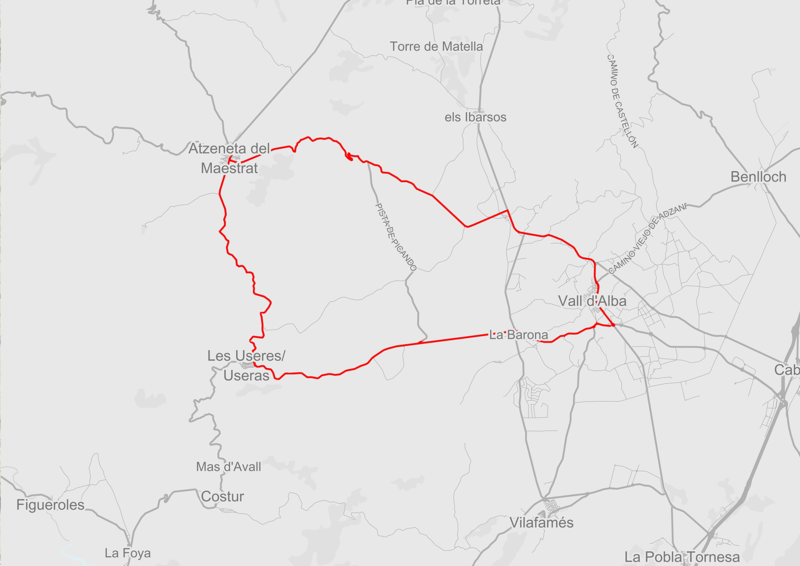 In Atzeneta del Maestrat we propose a beginners route which is not too long and covers a total ascent of 595 m. Over the 38 km we will enjoy the scenery of Maestrat and the Plana Alta over a comfortable road which only poses two real challenges. 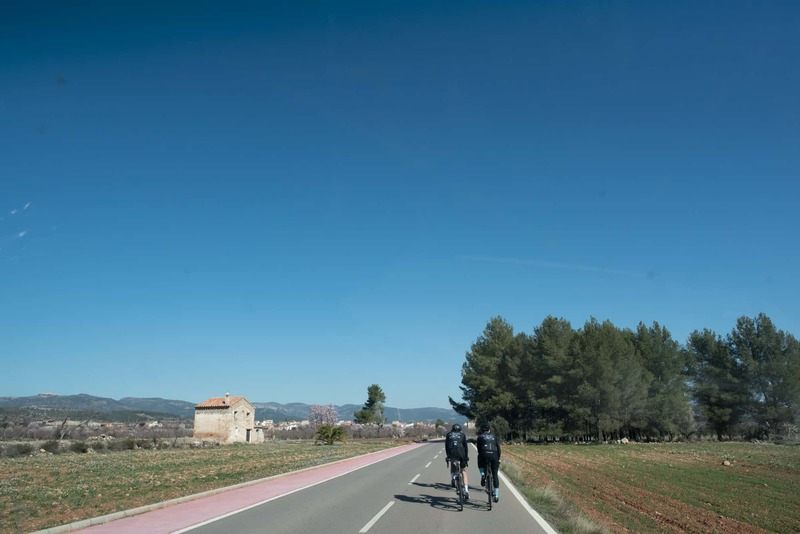 The first of which we find just 2 km after leaving Atzeneta del Maestrat in the direction of Vall d'Alba along the CV 170, when we come face to face with the Coll de la Bassa hill. After a 1.6 Km uphill stretch, which we will overcome without any difficulties, we will reach the highest point on the route at 507 m above sea level. Once we have passed La Pelechaneta, we leave the CV 170 and take the CV 15 towards Vall d'Alba. 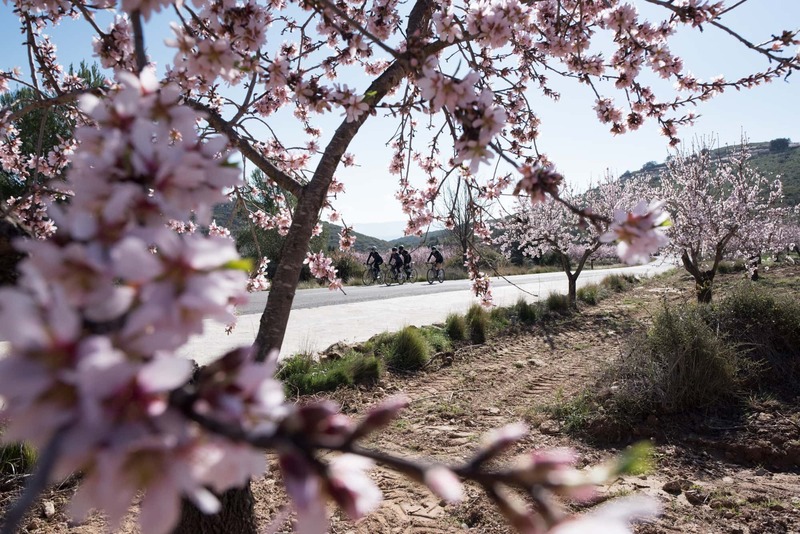 Leaving Les Ramblelles behind us, we come up against a 4.4 km slope, however its incline will not cause us too much on an issue and as we cycle along we will be able to enjoy the river Ramblella and breathe in the fresh air among the olive groves. 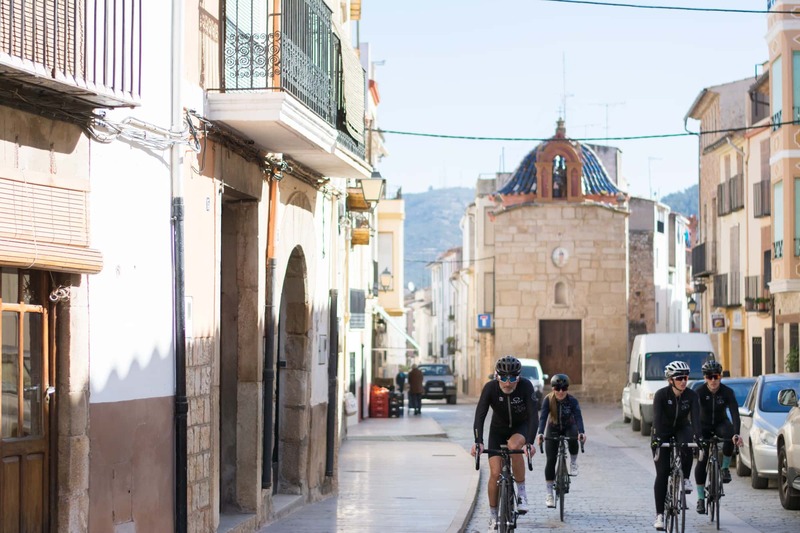 Once we get to Vall d'Alba, a 10 km downhill and flat section takes us almost to Les Useres, and we also pass through the small town of La Barona. Next, take the CV 165 which will take you back to Atzeneta del Maestrat. 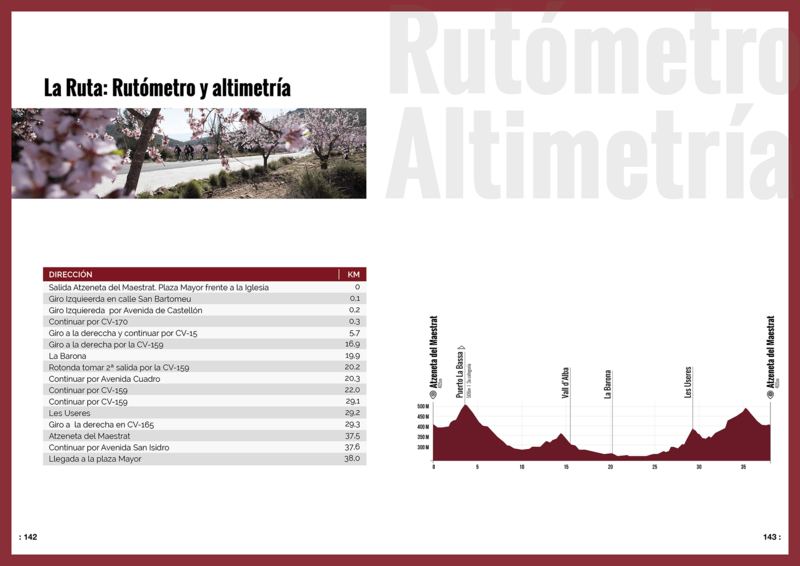 After kilometre 25, the last 13 kilometres we face, which connect Les Useres with Atzeneta, are all uphill. When you have gone past Les Useres you must make one last effort to overcome a 3.2 km incline with a 4.4% gradient, although this should not be a great problem even if you are a beginner. Once you get to the top, you can relax your legs and enjoy the last 3 km along a flat section which takes you back to Azteneta del Maestrat. - Coll de la bassa (Km 3,6): a small mountain pass which connects Atzeneta del Maestrat with the Rambla de la Viuda. Tree-lined slopes lead to the peak where a pool, which the mountain pass is named after, can be found. - Vall d’Alba (Km 15,1): municipality which takes its name from the Alquería Abla Muslim settlement. It is currently home to 3,000 inhabitants who live of the land, particularly the vineyards and olive and almond groves. - Les Useres (Km 29,1): municipality in the region of Alcalatén located between gorges and mountains. Although it has less than 1000 inhabitants, you can visit four chapels and an 18th century parish church located on the castle ruins. Casa Ramón (Avenida Castello 74): a traditional bar where a typical lunch can be enjoyed. 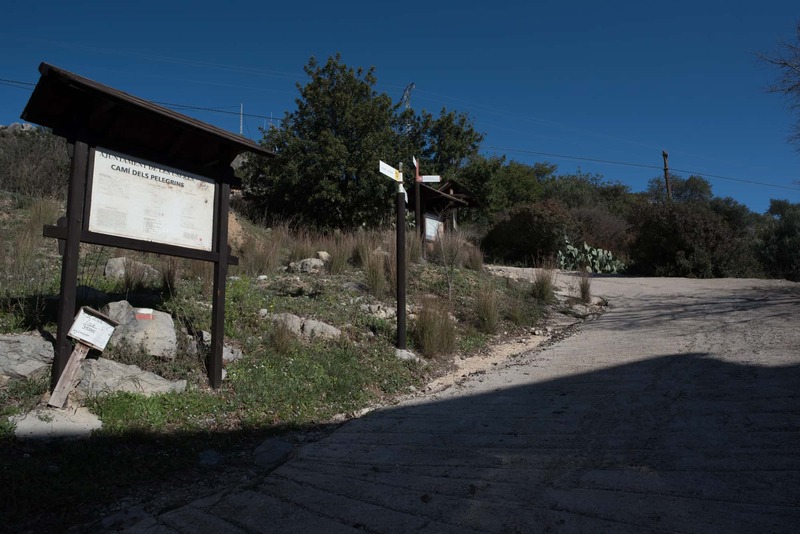 El Magranar (Carretera de Xodos km 3,4): a rural restaurant and hotel surrounded by nature. El Mangranar rural hotel: a rustic hotel located in the middle of nature, some 10 km from Atzeneta del Maestrat. - Hotel Mas el Cuquello: a 19th century rural house located 7 km from Azteneta del Maestrat.